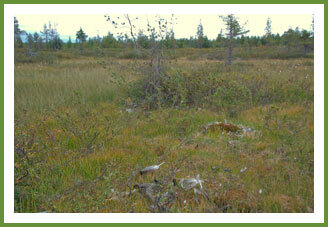 In July 2008 a male colt was captured from crane ringer Petteri Mustakallio’s research area in Maaninka, Central Finland. The colt was thus named after Petteri. 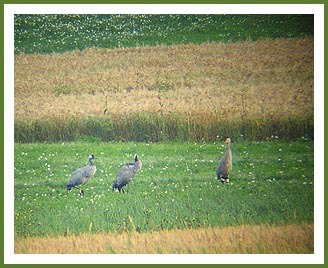 The crane family thrived on the cultivated fields of Lapinjärvi area in Maaninka prior to autumn migration. 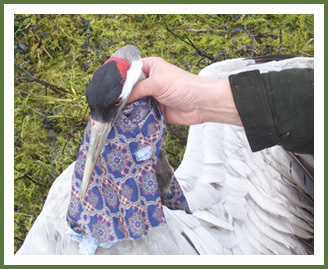 In late September the family joined a flock of circa two hundred cranes fuelling for migration. Petteri-crane left Maaninka on 25th September. 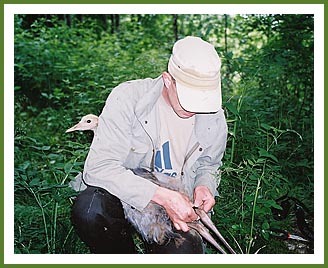 An adult male Olli was the first one deployed in the field season of 2008. 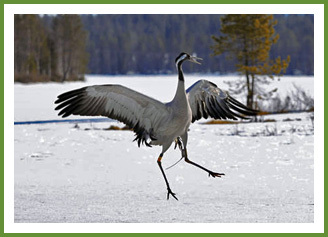 The summer home range of the crane extended beyond the Russian border and the bird frequently flew across the border in changing the foraging areas during the course of summer. On 29th August the crane was located on Finnish soil 1,5 km apart from Russia. Surprisingly, the next locations received two days later came 870 km to the southwest of Kuusamo-municipality. 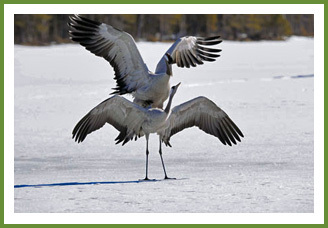 Olli-crane was nighting over in Põgari-Sassi, which is one of the most important crane roosting sites in Estonia. This roost belongs to the Matsalu staging area where approximately 10000-20000 cranes assembly during the autumn migration. 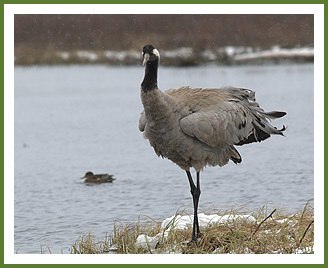 An adult male Mauri left his breeding grounds by the 14th August and has since thrived in a flock of 200 individual cranes in Tervola-assembly area 75 km apart the summer territory in Rovaniemi-municipality. 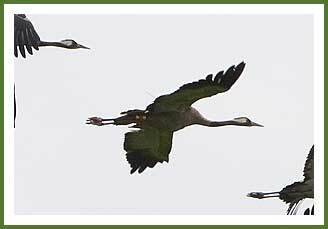 Of the new satellite cranes Renttimä-crane was the first one to commence autumn migration already in the beginning of August. Between 19th and 29th August he has been staging in the cultivated fields by the Siikajoki-river 320 km apart his breeding grounds. Having lingered for three weeks on the cultivated fields by the Siikajoki-river, Renttimä continued his autumn migration by taking a 650 km leap to the SSW. 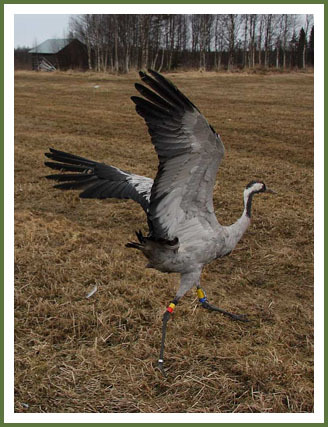 The crane was located foraging 1,7 km apart Olli-crane in Matsalu area. Renttimä kept feeding until 7 pm and was thirty minutes later located at the night roost Põgari-Sassi, where also Olli-crane has been nighting over for 8 days. So far Renttimä has traveled 964 km of which only 10 km have been extra. 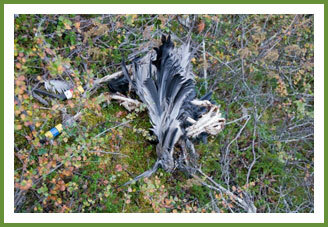 An adult female Aino was mounted with a satellite transmitter in Salla, Eastern Lapland in May 2008. She spent the summer on her territory and apparently reared a colt or two. She was the last one to embark the autumn migration. Unlike Matti-crane she did not end up at the Muhos stop over site but instead went 10 km further to the west and was located in Liminka assembly area on 8th September. Although the accurate date of migration is not know it presumably took place already on 31st August when the flying conditions were excellent. Colour bands are attached to the colt by the crane ringer Petteri Mustakallio. 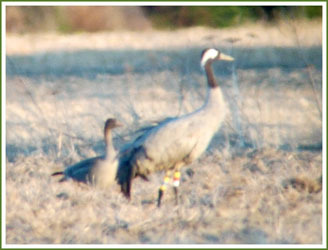 Petteri-crane together with its parents prior to autumn migration. Olli taking off after the deployment of the transmitter. Olli in spring (bird above) 2009 in his home field in Kuusamo. Mauri was discovered at flight in Tervola-staging area. Renttimä wades in the sleet, a typical spring weather in eastern-Lapland in May. 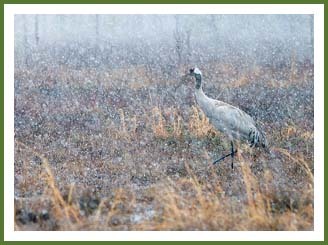 Crane-mister Matti continued his adventures in 2008. 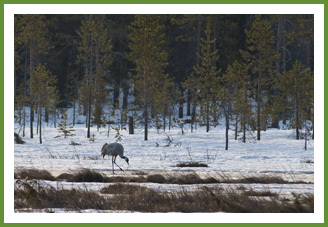 Matti-crane in spring 2009 in his home swamp in Salla. 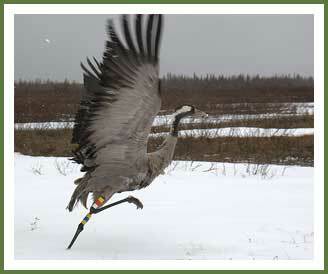 Aino taking off after the deployment of the transmitter.